Americans celebrates the Fourth of July several ways: cook-outs, fireworks, parades. 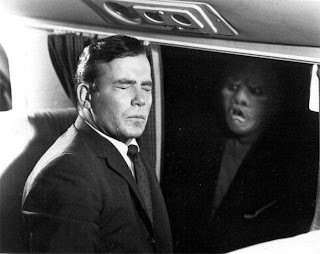 But some of us look forward to the day our great country achieved its independence because Syfy runs its second marathon of the science fiction classic, The Twilight Zone. Also held on New Year’s Eve and Day, the marathon runs from 8 a.m. on July 4 through 6 a.m. on July 5 with the “fan favorite episodes” running during prime time. Rod Serling and his fantastic imagination brought us this iconic series that ran on CBS from 1959-64. It cleverly tackled some of its day’s terrifying issues such as the threat of nuclear war and even alien invasion. The show was reincarnated with a film in 1983 and through a revival in 1985-87, but most will argue that the original episodes, which features some huge stars (Robert Redford, William Shatner, Burt Reynolds), are the no doubt the best. Will you be partaking in the paranormal festivities? We’d love to know what are your favorite episodes.